One day, one focus: optimism. 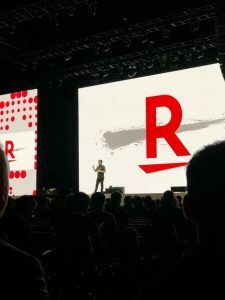 That was the word that stood out after attending the Rakuten Optimism event in San Francisco. 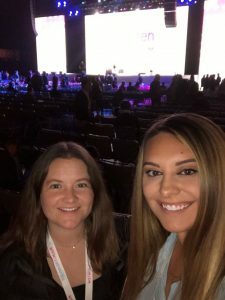 Not only did this retail and marketing conference bring together innovators in e-commerce and digital media, but it also connected the Bay Area tech community with each other. As recent Fellows at the H+K San Francisco office, this experience gave us the opportunity to grow as young professionals. We got to see a variety of industry experts speak on a variety of topics in tech as it relates to the Rakuten brand. It was especially interesting to see how impactful Rakuten Founder and CEO Hiroshi Mikitani’s relationship was with other companies. These collaborations allowed brands to grow from no-name start-ups to multi-million-dollar industries. The three panels that stood out to us the most were the Golden State Warriors panel with Center Forward Jordan Bell and Assistant Coach Mike Brown, the Lyft panel with Co-Founder and President John Zimmer and the Rakuten panel with Founder and CEO Hiroshi Mikitani. The Golden State Warriors panel focused on the importance of remaining optimistic. Bell explained that as a professional athlete you’re faced with several challenges; from injuries to games lost, it’s often difficult to stay positive. Coach Brown revealed that the key to remaining optimistic is taking time to appreciate success and “[sharing] it with the people you love.” Both Bell and Brown agreed that there’s a strong sense of family amongst players, faculty and the surrounding Bay Area community. It’s because of these supporting elements that the Golden State Warriors made it through hardships, won championships, and continue to value optimism. The final panel with Rakuten’s Hiroshi Mikitani focused on optimism and driving customer loyalty. Mikitani discussed how the company started out as a small, simple website and has since expanded into a vast global marketplace. The company is making the future of retail and advancements in shipping technology a high priority, with consumers today wanting their items instantly. Faster services and the implementation of mobile app tracking lets Rakuten accommodate these on-demand customer needs. “If you want to compete, you need to know who is buying what. You need to know who can potentially become your loyal customers,” he said. Rakuten isn’t just another mass e-commerce site – there’s a story behind every vendor and every product. Mikitani stated that “high quality products and services with a human touch” drive customer loyalty. 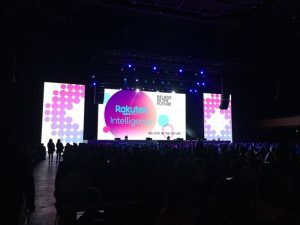 As this was one of our first client events, we realized how influential the Rakuten brand is throughout Silicon Valley. From their U.S. partner relationships to their venue choice in the heart of San Francisco, optimism brought a whole new perspective to how we view company value. Since we are Fellows at H+K, our main roles were gathering quotes from panelists and capturing event photos. We used brief break periods to network with industry professionals; it was great to congregate with other attendees and discuss the exciting panels. It was inspiring to see how much these companies value customer loyalty. We left the event optimistic.